Many aircraft engines were available after the First World War, because Germany was not allowed to have any aircraft. This is what British motor sport enthusiasts had been waiting for. Brooklands, the oldest race track in the world, had two banked curves. It was an invitation to high performance. It was a simple matter to mount an aircraft engine on an old chassis, and use it for racing purposes. Since Brooklands had banked curves, brakes were not so important, so only a rear brake was the norm. A chassis with a 1907 chain drive forms the basis of the Brutus experimental vehicle, a drive that was used for a long time by fire departments in America. 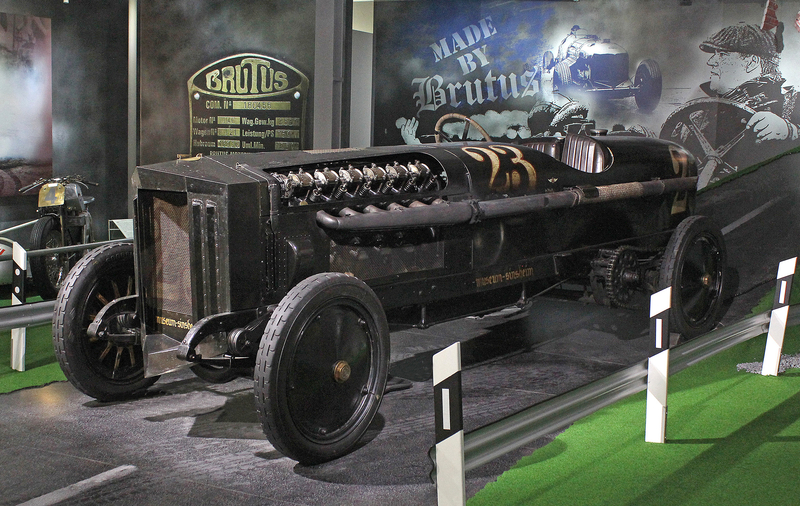 A 12-cylinder BMW aircraft engine was mounted onto this chassis, with a cylinder capacity of nearly 47 litres (from the 1st World War). A special feature of the BMW aircraft engine VI was that it operated with six main and auxiliary connecting rods, a design that was very popular because it saved on space and weight. Due to the different rod lengths, the cylinders on the right side each have four litres of cylinder capacity, whereas the opposite only have 3.82. This yields a total 46.92 litre cylinder capacity. The BMW yields 550 hp at 1530 rpm as continuous performance, and 750 hp at 1700 rpm for short performance. The fuel consumption is approx. 2 barrels of premium fuel per year. During World War I the engine powered heavy bombers, and was used into the 30s in the Wal (whale) flying boat, among other things. The engine output comes about via the original three-gear gearing mechanism, and a chain transmission on the rear axle. The brakes only act on the rear axle. The car has no bulkhead. The driver sits directly behind the engine, the moving parts of which (e.g. the flywheel) are only separated from the driver's compartment by a grid. The driver is thus more or less directly exposed without protection to the motor's waste heat and any leakage. The thrill of this vehicle is not least in its ability to reach a speed of over 200 km/h with low rotation counts. Roger Collings from Wales raced at 200 km/h on the high-speed oval of the Bosch test track in Boxberg, with its two steep-banked walls. Apart from Roger, no one else has attempted this.